Our Pattern of the Month for November is Dahlia! Dahlia is a flattering and feminine dress that offers two distinctly different versions. Version 1 features a raglan sleeve and is perfect for stitching up in a wool plaid or tweed. Version 2 is sleeveless with a bias finished neckline and underarm. Though these two dresses represent two different seasons of clothing, they have gorgeous figure flattering lines in common. 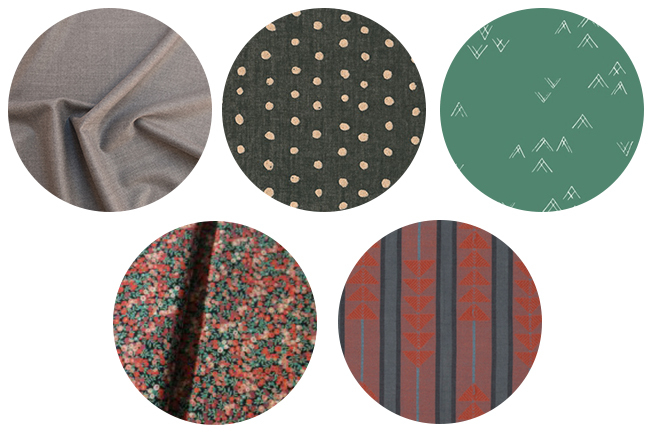 In celebration of Dahlia month, we have rounded up five fabrics perfectly suited for Dahlia. Through the end of November, you can get Dahlia for 20% off when you use code DAHLIAMONTH at checkout. We’ll also be sharing a pattern hack later this month, so stay tuned! Shop Dahlia with 20% off! I love, love, love this dress! However, as a 60+ professional, I find the neckline a little too low. Do you have any tips on making the neckline a little more modest? I will be sharing a pattern hack later this month that will modify the fit of the shoulder and neckline. So stay tuned! Watching this with interest! Dahlia is in my queue, probably a v1 bodice with a v2 skirt. I have a length of grey eyelet lace set aside, but after reading this I’m wondering if it might be too thick/ heavy. Quite a few pattern reviews have talked about the wide neckline and sleeves; do you have any suggestions for narrowing these?